* Having a good win to loss ratio. * Doing anything Naruto-Arena related. This includes (but not limited to) playing matches, posting on Naruto-Arena, Helping other clan members, etc. * The highest level you have ever achieved in Naruto-Arena. * The most amount of games you won in a row without receiving a loss. * Any thing that you wish to submit to the clan such as avatars, tags, banners, signs, userbars, etc. Work given must be approved by the creator and credit must be given to the creator. * Having an avatar or sign that has clan name on it or has its abbreviations (sky). 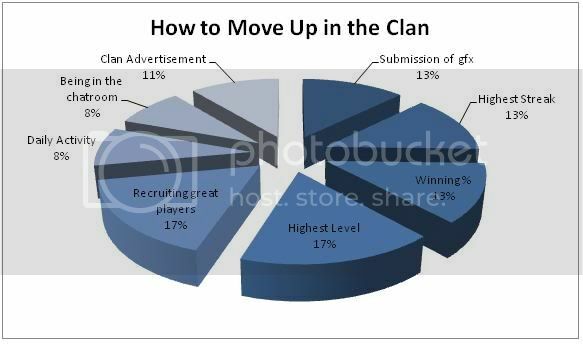 Telling other people about clan and its awesomeness through private messages, Naruto-Arena boards, in chatbox and any other form of communication. * Getting others to join the clan and sending invites to deserving clanless people. * Coming to the chat room when you have time to interact with the rest of the clan.